Other than farming, what is common between the farmers in drought-hit Shivpuri district of Madhya Pradesh and those in Madagascar? They are all struggling with hostile takeover of land by outsiders. Farmers from Punjab and Haryana, where agriculture has become unproductive, driving up input costs, are scavenging for cheaper options. They are targeting drought-hit districts like Shivpuri, which not only provide land at a cheaper rate but also make leases easy as land ownership records are not properly maintained. In Madagascar, farmers have gone to war against a South Korean company that is acquiring 1.3 million hectares (ha) of cultivable land without any compensation. After sustained opposition, the deal is on hold. In Madagascar, like in many other countries in Africa, there are presumably vast swathes of “waste” land without clear land ownership. This is a lucrative option for governments and food companies across the world that are rushing to the continent to grab land. In both scenarios, local people hardly benefit as most of the grabbed land is used for growing biofuel and food crops for export. Small farmers with unclear land deeds in these places are the victims of a new geopolitics, ironically, drafted and crafted by soaring food prices and the failure to meet the rising global demand for food. Biofuel is another newfound gold, triggering the land rush. In a recent food price report, the UN warns that the world is again closer to the food price crisis of 2007-2008 that witnessed widespread riots. There is a clear link between global food price rise and increasing land grabs in poor countries. 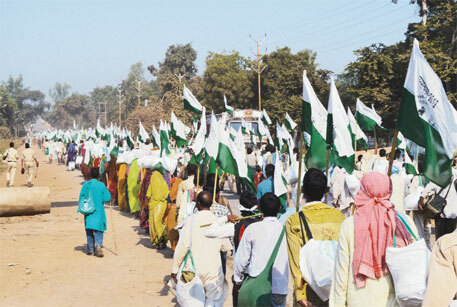 Within India, there are no official records of land grabs, only occasional protests. At the global level, however, there is credible data on cross-country land deals. A careful study of such deals brings out the well-orchestrated loot, with Africa being ground zero—it has the world’s largest reserve of uncultivated land and weakest governance systems. Of the 445 million ha of uncultivated land in the world, 201 million ha (over 45 per cent) is in sub-Saharan Africa. After the 2007-08 crisis, global land deals picked up as countries and companies became uncertain about the food supply scenario and land availability in future. Between 1961 and 2007, every year, about 4.1 million ha of land was put to agricultural use; 1.8 million ha came from African countries. But in 2009, immediately after the food crisis, governments and companies finalised land deals covering 56.6 million ha—14 times that of the global average. In Africa, foreign countries and companies acquired about 40 million ha that year. According to the International Land Coalition, an alliance of civil society and intergovernmental organisations, of the 1,000 international land deals signed between 2009 and May 2012, 46 per cent were in Sub-Saharan Africa and 37 per cent in Asia. On the face of it such land deals seem logical because more food needs to be produced to meet growing demand. With such huge addition to the cultivable land, food prices are also expected to reduce. But a closer look at the deals explains why this rush is unethical and will not help curb soaring food prices. International Land Coalition’s analysis shows that about 75 per cent of the land will be used to grow non-food crops. Of the 665 international land deals that report a specific crop, 55 per cent relate to biofuel production, 19 per cent to forestry products for wood and fibre and flowers, and the rest for food production. The International Food Policy Research Institute’s latest Global Hunger Index (GHI) shows that the world’s hunger hot spots are the preferred countries for securing land. “Majority of the international land deals to date have occurred in those countries that experience higher levels of hunger and where the population and national incomes depend heavily on agriculture,” says the GHI released in October. Most of the land was in use for sustenance farming by the world’s poorest farmers in the most food-insecure areas. Governments justify these deals to improve their fortunes by allowing industrial farming. The land rush is entering an absurd phase now: finding solution to global food security has pushed a vast population into the abyss of hunger. GHI says the land grab will further precipitate hunger and food insecurity. It will also lead to displacement of farmers from agriculture on a scale unheard of in recent past. According to international non-profit Oxfam, in the past one decade, foreign investors had been buying land equal to the size of London every sixth day in developing countries, displacing thousands of occupants. The total sold off land, according to Oxfam, could have fed one billion people who go to bed hungry every day. This is one step forward and two steps back.